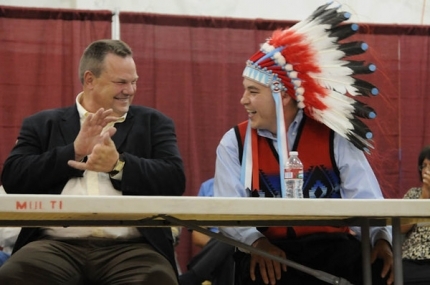 Montana Senator Jon Tester is making waves as head of the Senate Committee on Indian Affairs. After touring Native communities around the country, he strives to lend a hand to tribal education systems, health care, and local ecology. Tester plans to introduce legislation regarding tribal schools, which are of his utmost concern, in November. A former educator himself, the senator has taken great care to meticulously assess tribal needs and specific budget issues. His bill is said to streamline the application process for grants/funding, provide resources for native language immersion, and bring qualified teachers into Native school districts. With Indian Country teacher turnover rates reaching peaks as high as 70%, there is a dire need for dependable faculty. Tester believes that honing in on the basic infrastructure of Native communities, such as housing and food supplies, prospective school staff will have a smoother experience settling in to the communities they work in. By tackling areas issues such as under-funding and overcrowding head on, Tester and his team aspire to push forth with widespread, long-lasting change. Problems such as certain states’ resistance to expanding the Medicaid program make it difficult for hospitals serving Native communities to receive adequate funding. For now, they rely on federal money, which does not accommodate the realty of expanding client lists. Addressing these healthcare budget concerns remains a priority for Tester. The senator also made time to examine environmental problems that negatively impact the tribes he visited. Many Natives face the same challenges as LaDuke–declining water quality, hunting/fishing prospects and harvests remain vital components of tribal culture and economy. Tester believes that bringing together tribes, local communities, and federal support systems to address these issues will lead to eventual solutions. Tester’s involvement in current tribal issues is encouraging. Lakota People’s Law Project is inspired by his incentive to bring justice to Native communities. Hopefully, the road to reform will be a smooth, rewarding process. How do you feel about Senator Jon Tester’s recent actions? Are there any other major issues you think he should be addressing as an advocate for Native rights?